Simple and sophisticated, the Georgia fireplace is a no nonsense surround that is perfect for a modern, minimalist interior. Finished in our beige stone marble, this surround comes complete with the Adam Ontario electric fire which is guaranteed to impress with its unique LED-X flame effect and log effect fuel bed. This fireplace is supplied with a 7-day programmable timer remote for which you can control the flame effect and adjust the thermostat heat output between 1Kw and 2Kw. Recess:H 680mm x W 560mm x D 180mm Approx. 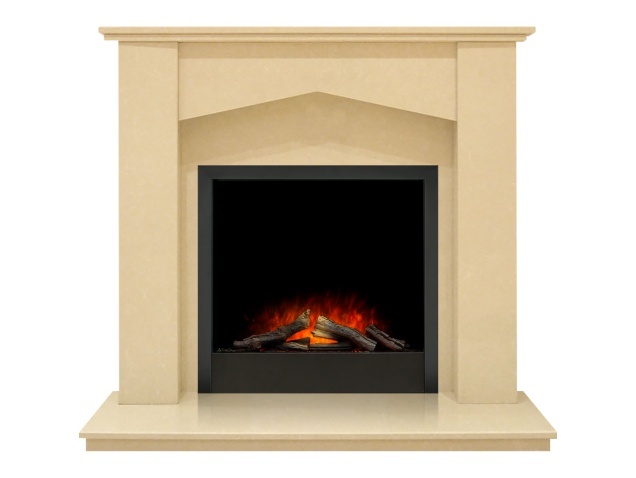 Are the Aurora Marble Surrounds suitable for solid fuel fires? No. Our marble is heat tested to a maximum of 4kW output. As you cannot control the heat in a solid fuel fire, it could cause the marble to crack. Our Limestone surrounds however are suitable, but only when combined with a solid fuel hearth (known as a slabbed hearth) and suitable back panel.